Hideki Tojo was born in Tokyo on December 30, 1884. The son of a general, his own rise through the military was helped along not only thanks to his lineage, but also due to his innate intelligence and uncanny ability for quick thinking, even under extreme pressure, which earned him the nickname Kamisori, or “Razor.” Entering the military in 1905, by the mid-1930s, he had earned the rank of lieutenant-general. 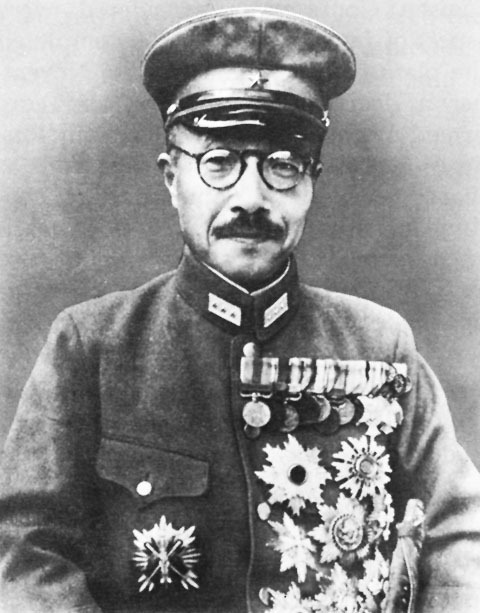 Tojo was appointed as Vice War Minister and Chief of Army Aviation within three years and ordered preemptive strikes against both China and Russia. By 1940, Prime Minister Fumimaro Konoe promoted Tojo to Minister of War. He immediately began working to form an alliance with Germany and Italy. As tensions built, economic sanctions were ultimately placed on Japan by the United States, most notably resulting in 80% of Japan’s oil imports disappearing overnight. This was significant as, before this, the emperor had been leaning towards a diplomatic solution with the United States, but gradually began to shift his thinking. Prime Minister Konoe, however, was adamantly against a war with the U.S. and very actively attempting to get a peace treaty with the United States established. This is something he was close to accomplishing, but for a few sticking points that the Japanese military brass refused to bend on, but Konoe had been willing to grant to achieve the peace treaty. For the past six months, ever since April, the foreign minister has made painstaking efforts to adjust relations. Although I respect him for that, we remain deadlocked … The heart of the matter is the imposition on us of withdrawal from Indochina and China … If we yield to America’s demands, it will destroy the fruits of the China incident. Manchukuo will be endangered and our control of Korea undermined. Of course His Majesty is a pacifist, and there is no doubt he wished to avoid war. When I told him that to initiate war is a mistake, he agreed. But the next day, he would tell me: “You were worried about it yesterday, but you do not have to worry so much.” Thus, gradually, he began to lean toward war. And the next time I met him, he leaned even more toward war. In short, I felt the Emperor was telling me: “My prime minister does not understand military matters, I know much more.” In short, the Emperor had absorbed the views of the army and navy high commands. Shortly thereafter, Emperor Shōwa appointed Tojo as Japan’s new Prime Minister. Mere weeks later, the emperor and Prime Minister Tojo were committed to war with the United States as negotiations to finalize the proposed peace treaty continued to be at a deadlock. This particular war officially kicked off when the Japanese attacked Pearl Harbor on December 7, 1941, a plan of attack that had been in the development stage before Tojo became Prime Minister in case the peace treaty negotiations failed. During his time as Prime Minister, Tojo also served as the Home Minister, Foreign Minister, Education Minister, and the Minister of Commerce and Industry, as well as serving as a General. There was strong public support for Tojo and his policies until he lost Saipan in the Mariana Islands. He submitted his resignation to the emperor on July 18, 1944, with some in the public calling for him to commit suicide via harakiri. 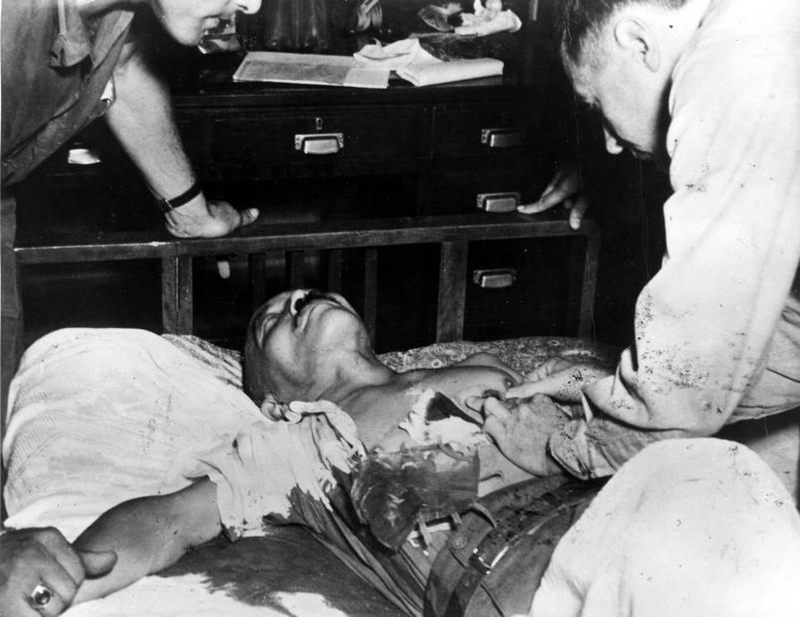 After the Japanese had surrendered, Tojo did indeed attempt suicide, but not with a samurai sword. On September 8, 1945, with American military police surrounding his home, intending to arrest him, he shot himself but missed his heart, even though a doctor had circled the spot for him. Maybe it was the U.S. military police banging at the door affecting the angle of his aim, because although he shot right through the doctor’s mark, he actually ended up shooting himself in the stomach. In fact, during the trial at one point Tojo accidentally referenced the emperor’s supreme authority in all matters- something he had been careful to avoid previous to this to protect the emperor. The American-led prosecution, via Ryūkichi Tanaka, then secretly coached Tojo to recant that part of his testimony, which he was happy to do. It is natural that I should bear entire responsibility for the war in general, and, needless to say, I am prepared to do so. Consequently, now that the war has been lost, it is presumably necessary that I be judged so that the circumstances of the time can be clarified and the future peace of the world be assured. Therefore, with respect to my trial, it is my intention to speak frankly, according to my recollection, even though when the vanquished stands before the victor, who has over him the power of life and death, he may be apt to toady and flatter. I mean to pay considerable attention to this in my actions, and say to the end that what is true is true and what is false is false. To shade one’s words in flattery to the point of untruthfulness would falsify the trial and do incalculable harm to the nation, and great care must be taken to avoid this. Unsurprisingly, he was found guilty and sentenced to die on November 12, 1948. At his execution on December 23rd, he implored the Americans to be compassionate towards the Japanese people and apologized for atrocities committed by the Japanese military under his command. Today, Tojo’s ashes are among those honored with a place at the Yasukuni Shrine, which is still somewhat controversial to this day. The word, “Shōwa,” should be replaced by “Hirohito.” Not only, in my opinion, would almost no one reading this page be familiar with the name, “Shōwa,” but it is actually inappropriate within the context of the quoted sentence. When referring to a specific event, one should use the personal name of the emperor (Hirohito), not to the name bestowed upon him posthumously (Shōwa).